It was initially thought that the The F5 therefore saw an ACK packet for a TCP segment that it hasn’t seen, so it sends a RST packet in both directions to tear down the TCP session. 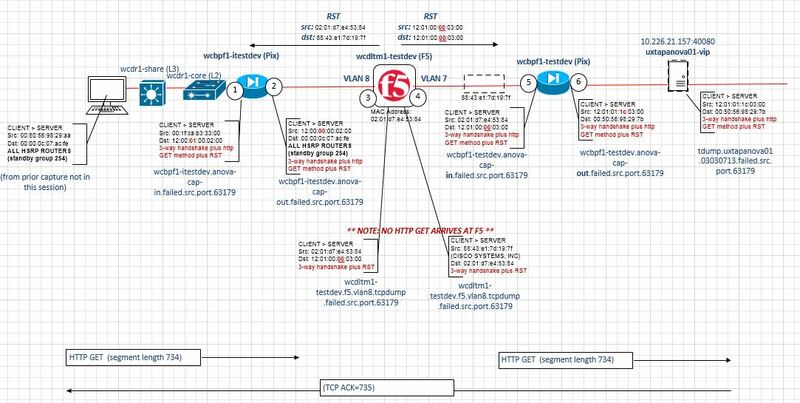 This is a little confusing because the TCP session goes through the F5 but the HTTP GET request seemingly bypasses the F5 but does arrive at the server. After a bit of head-scratching and furrowed brows because it made no sense. The delay. The fact that there clearly wasn’t any asymmetry anyway because the ACK came back via the same path. So why the reset? Further investigation (i.e. Googling the F5 Knowledge Base) revealed that a fastL4 profile might explain the absense of the HTTP GET request because tcpdump on the F5 sometimes doesn’t catch all of the packets (See SOL1433 and also when PVA chips are used see SOL6546 ). Connection Idle Timeout of 300 seconds – If an established session does not send a packet within this time the sessions is timed out on the LTM. 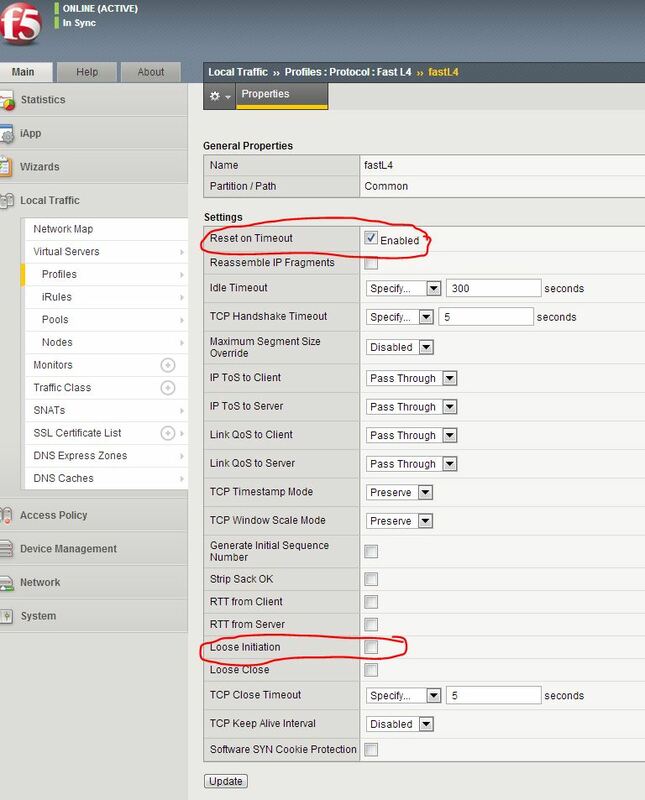 Reset on Timeout – When a session times out TCP resets are sent to client and server to terminate the connection. 1. Get pid of the socket with netstat. 2. Check process details with ps. tcp_keepalive_probes : Number of KEEPALIVE probes sent before the connection is reset. tcp_keepalive_time : Frequency of KEEPALIVE messages. The default is 7200 (2 hours). You can change the values by updating the files in /proc/sys/net/ipv4 or sysctl . To make it permanent add it to /etc/sysctl.conf. If you needed to alter the timeouts on TCP sockets, modify /proc/sys/net/ipv4/tcp_keepalive_time to setup new value. The number of seconds a connection needs to be idle before TCP begins sending out keep-alive probes. Keep-alives are only sent when the SO_KEEPALIVE socket option is enabled. The default value is 7200 seconds (2 hours). Adapter-specific values are listed under subkeys for each adapter identified by the adapter’s globally unique identifier (GUID).